The Ghanaian pilot with Emirates Airlines, Captain Solomon Quainoo, has said that Ghana was put in the centre of the historic flight of the world’s biggest passenger aircraft to the country for the first time last Tuesday. “Emirates wanted everything about the flight to be Ghanaian, which I think is good for the image of our country. I hope it will motivate the country to invest more in the aviation industry,” he said. The man who had done a little over 11,000 of flight time in his career never knew he would be the first Ghanaian to bring the Airbus A380 for the very first time to his country. Therefore, he said, when he landed the massive plane at the Kotoka International Airport (KIA), descended the gangway and saw hordes of his countrymen assembled to welcome him on the historic flight, he wept. “I don’t have words for that. When we landed and I got out of the gangway, I was emotional and overwhelmed by all the support. Ghanaians coming together to welcome me and the aircraft was just unbelievable and I cried,” he told the Daily Graphic in Accra this morning, October 4, 2018, as he prepared to fly back to Dubai later in the day. Explaining what went into the decision to make him fly the aircraft to Ghana, he said it was a decision taken by the technical department of Emirates. “They look at your records; they look at training and then the chief pilot and the chief technical pilot will have to decide and select you,” he added. Public announcements on the flight were made in Twi. Captain Quainoo said the flight was a very big thing and that Emirates Airlines invested a lot in that one-off trip. “They wanted to make it a very successful event for Ghana and they were happy to be here to be part of this special occasion. “Emirates invested a lot of time and money and they took a profile of me from my early years in Ghana and my time in secondary school. So we did a lot of things and moved around trying to put a lot of things together to make it a successful one….and bringing all the important dignitaries to Ghana on my plane,” he explained. The aircraft was in Ghana to experience the new thing in the country’s aviation industry – the Terminal 3 – and the pilot said it was worthwhile. “I hadn’t really experienced the Terminal 3 because this is the first time I used it since it was done and so I can’t really give much information about it. But from the little I saw, it’s a very modern terminal with bridges to accommodate any aircraft. Accommodating the A380 means it’s a very good terminal,” he said. He thanked Ghanaians for the wonderful show of support and said it was his wish that many Ghanaian youth would take up piloting as a profession. He said for the few days that he had been in his native Ghana he had been sharing his experiences with some Ghanaian youth to help build their confidence to train as pilots. 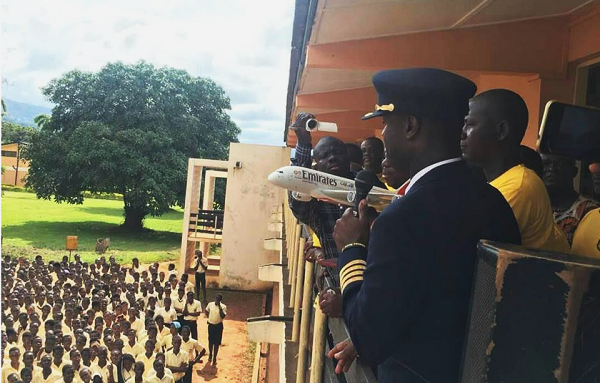 “Yesterday I shared my experiences with a group of young aviation enthusiasts and among them was one guy who had finished the grounds school and is getting to start the flying training but doesn’t have any money,” he said. He indicated that he had encouraged the young trainee not to lose hope and promised to assist him in whatever way possible to realise his dream. Meanwhile, Captain Quainoo last Wednesday interacted with staff and students of the Koforidua Secondary Technical School (SecTecH), his alma mater, in Koforidua in the Eastern Region, reports Naa Lamiley Bentil, Koforidua. During the interaction, he expressed the belief that students had what it takes to reach global recognition if they worked hard and persevered. Captain Quainoo said it was time the government turned its attention to the training of local pilots by investing more in it. According to the Emirates pilot, education and training as a pilot was a capital- intensive venture which might hinder interested Ghanaians from that pursuit. Later in an interview, Capt. Quainoo stated that aviation had not fully developed in the country and that was not because Ghana did not have the resources. “We have great guys who can do a lot of things. KNUST produces a lot of engineers who can do great stuff but the opportunities are not here and it is either you go through the Air Force or you cannot become a pilot. I think we need our leaders to be visionary and aim to make our country great,” he said. He said all over the world Ghanaians were achieving great things for other countries. “We have an old boy in the USA who is doing a lot of professional work for NASA. I have done a lot of great stuff for British Airways and other companies. This means Ghanaians can do whatever we want to do; we just need the support from the government to invest in our kids, schools, teachers and the nation as a whole,” he said. The President of the SECTECH Old Students Association, Mr Scofray Yeboah, said he was highly motivated by the visit of the pilot to the school and called on the government to make the school a model one. “SecTecH is a school that was set up with a mission to raise science and technology-based students for the Kwame Nkrumah University of Science and Technology (KNUST) and that is what we are all about,” he said.